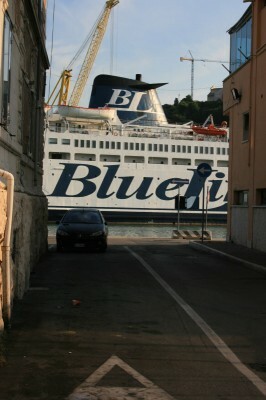 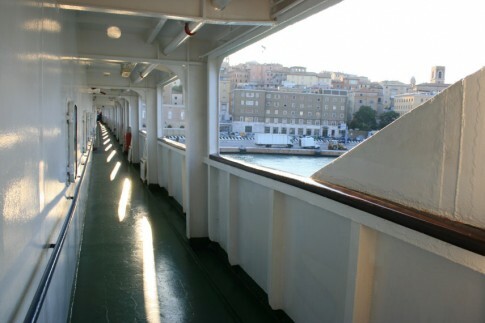 From Ancona to Split with the Ancona of Blue Lines. The Ancona off Ancona in 2004, before the masts were regrettably painted blue. 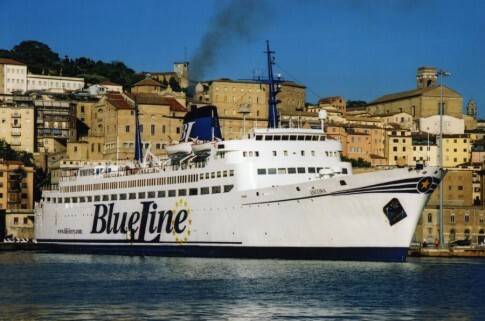 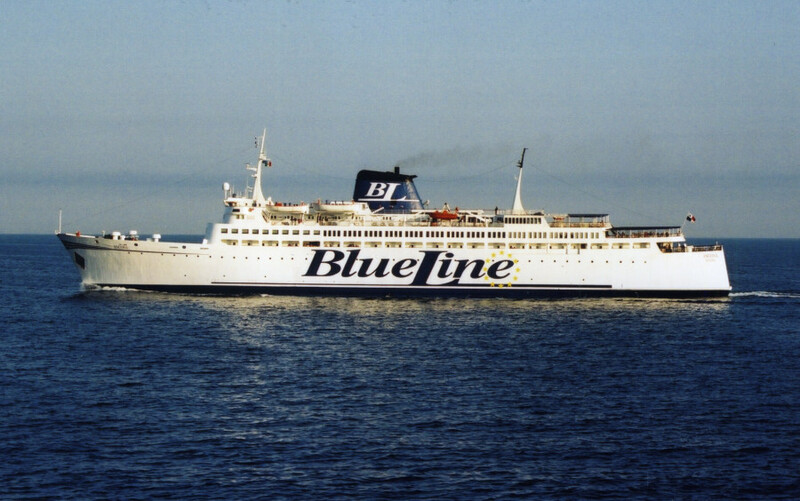 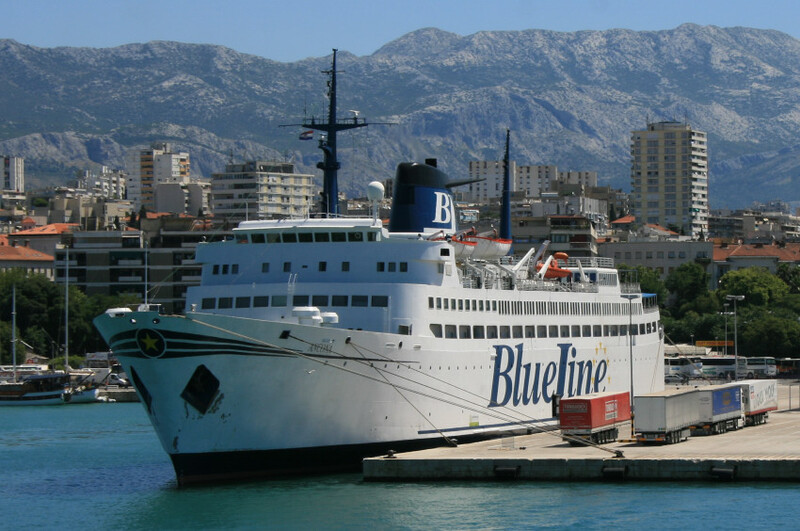 Blue Lines’ Ancona is the former Knossos of Minoan Lines, and before that the Saga, Hispania and originally the Svea of the Rederi AB Svea and latterly Swedish Lloyd. Today she plies the route between Ancona and Split year-round, accompanied in peak season by her fleetmate, the Split 1700. 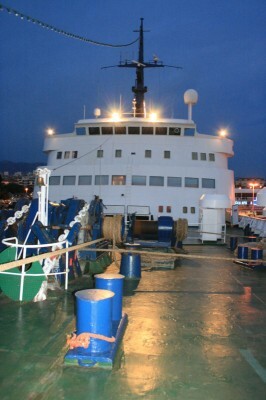 Presented below are a series of pictures of and on board the ship from the Summers of 2007 and 2008. 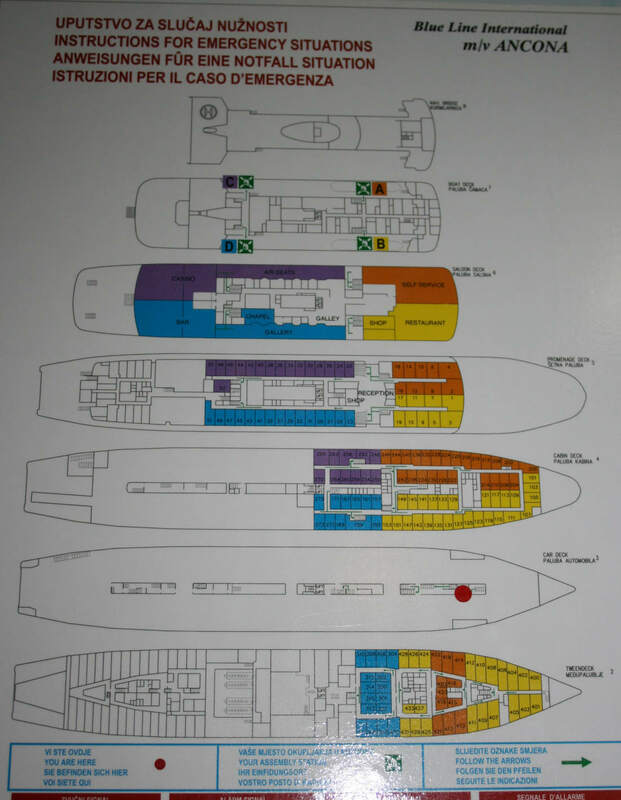 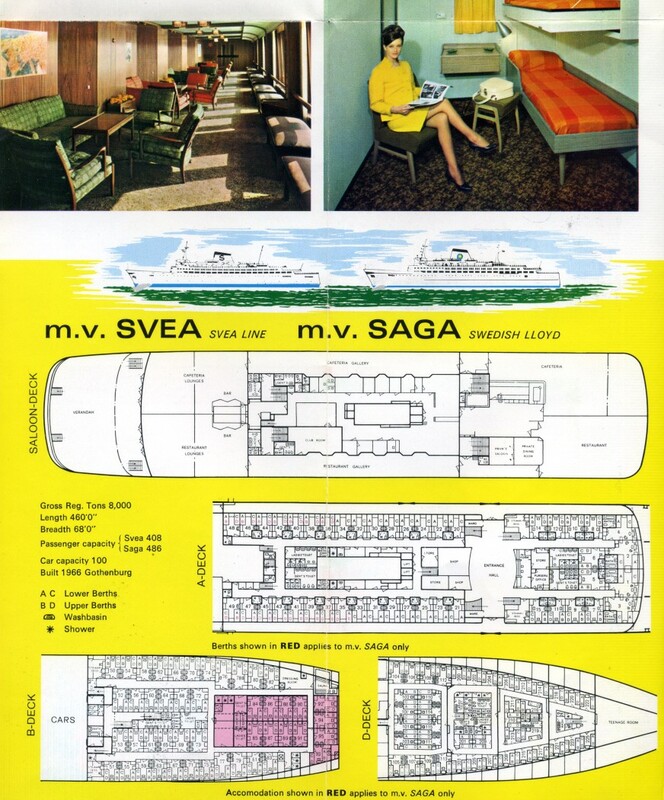 See also this deckplan photograph of the ship as the Ancona, and here in her original guise as the Svea. Walking down from the main railway station, Ancona ferry port veers into view with the Ancona herself sheltering behind the passenger terminal. 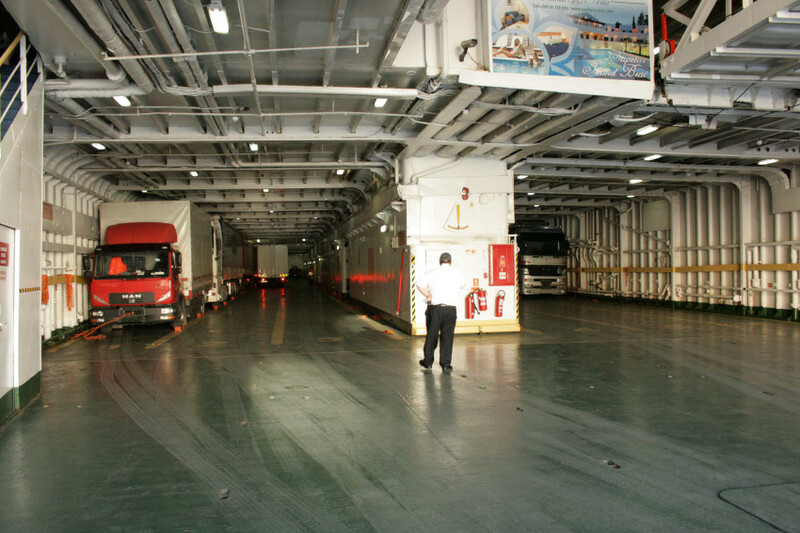 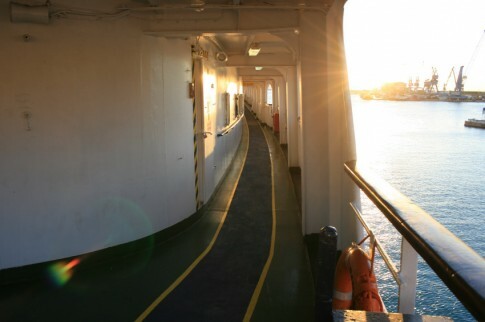 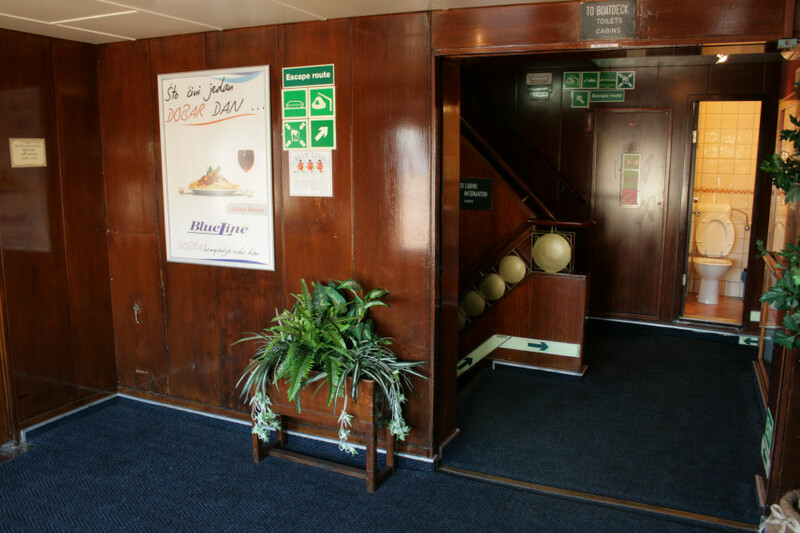 Boarding is via the vehicle deck - the relatively low headroom caused problems in her early days on the North Sea but has not stopped a successful later career. Walking up from the vehicle deck, passengers are directed along one of the two side promenades, heading forward in the direction of the lobby. 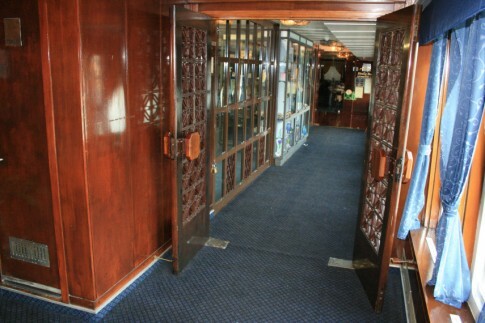 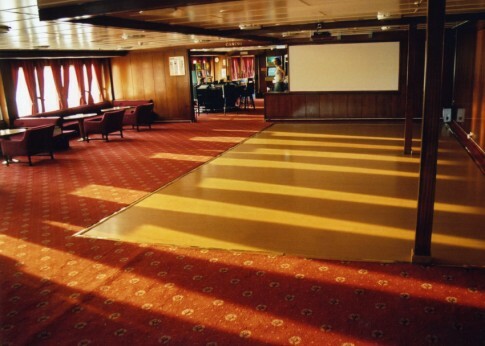 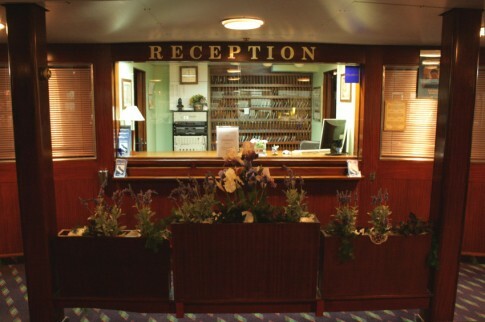 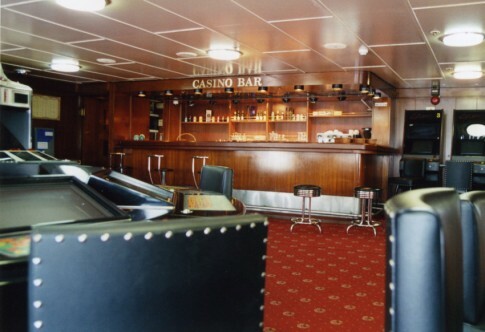 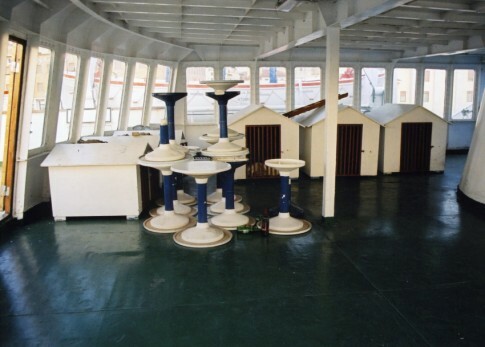 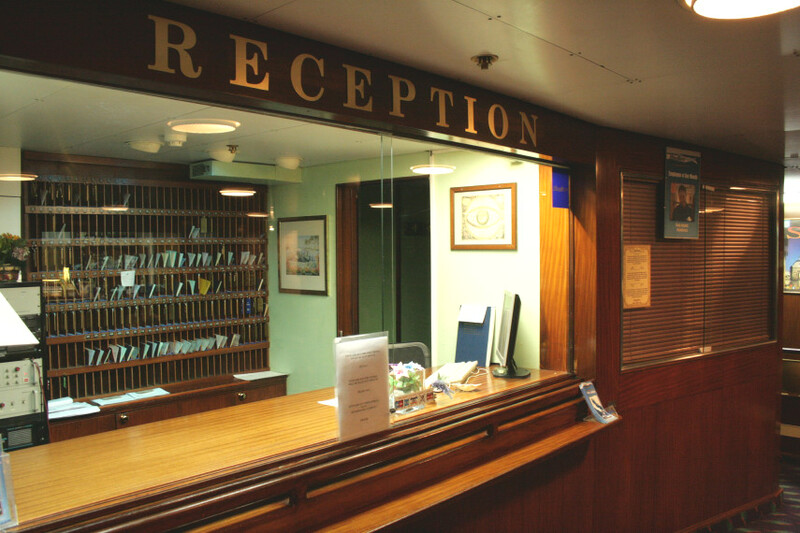 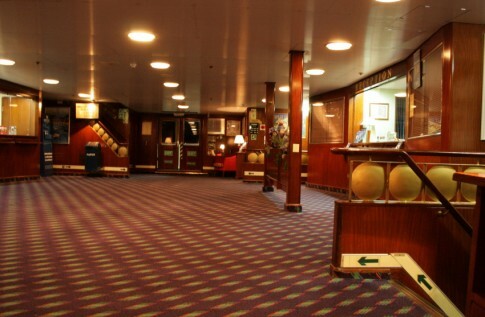 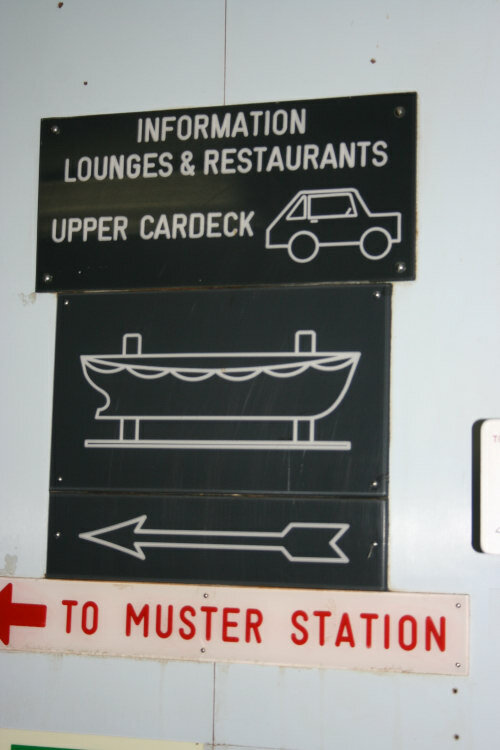 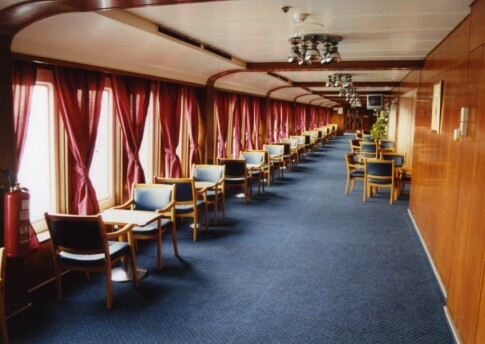 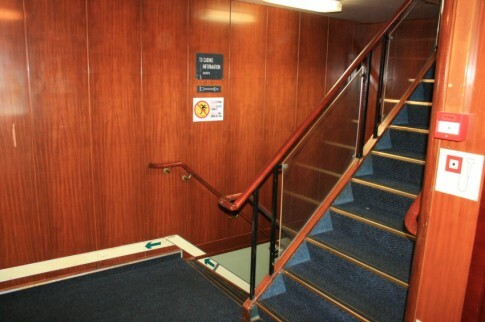 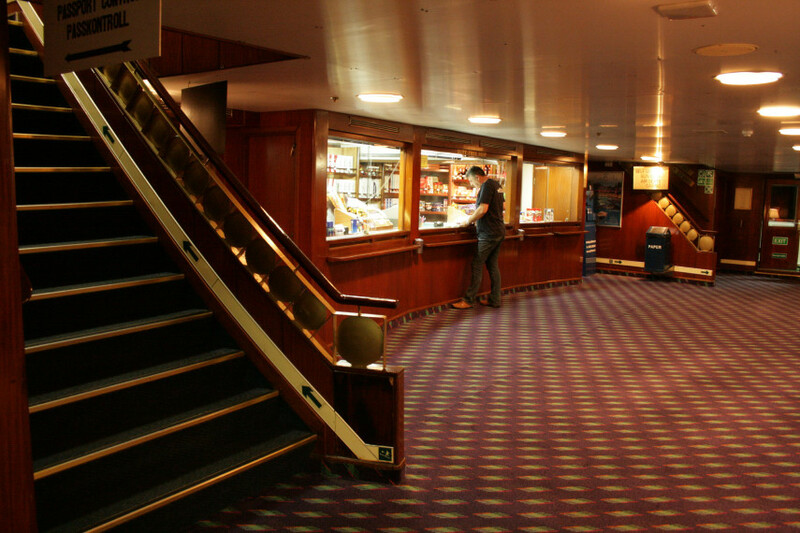 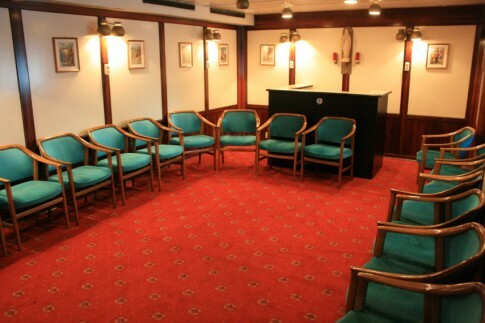 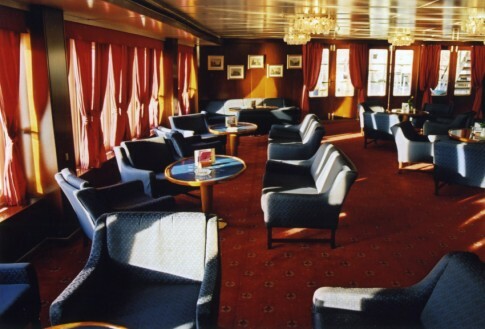 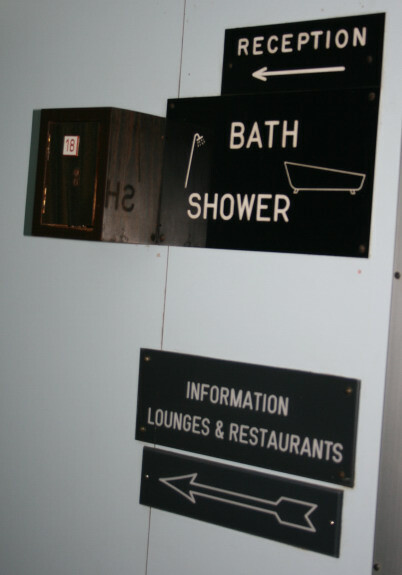 The main lobby is centrally located on Deck 5 (originally A Deck) which is otherwise given over to cabins. 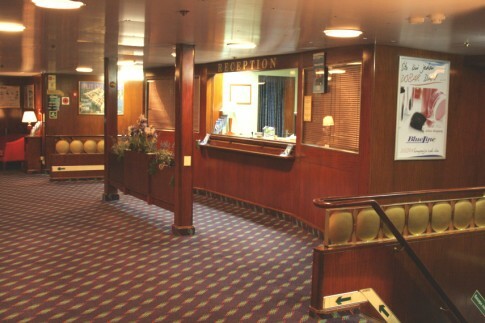 Reception is at the forward end of the lobby. Facing reception, on the aft side of the lobby is this small counter-service Duty Free shop. 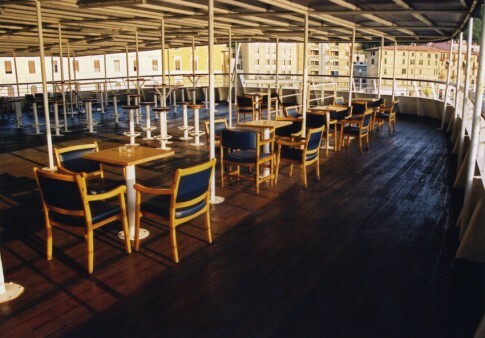 The cafeteria, looking forward from the entrance. Heading aft from the cafeteria, we enter the port side arcade. From the other end, looking forward on the port side of the Saloon Deck. 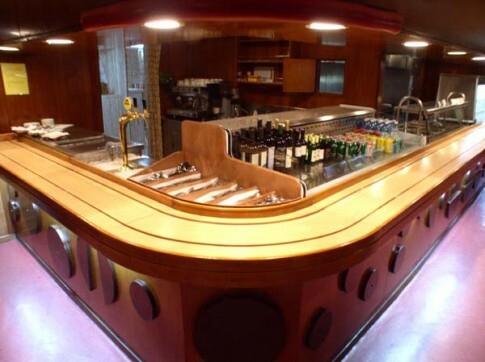 One of the two aft port lounges has had casino and gaming equipment installed, but it still retains its original bar counter. 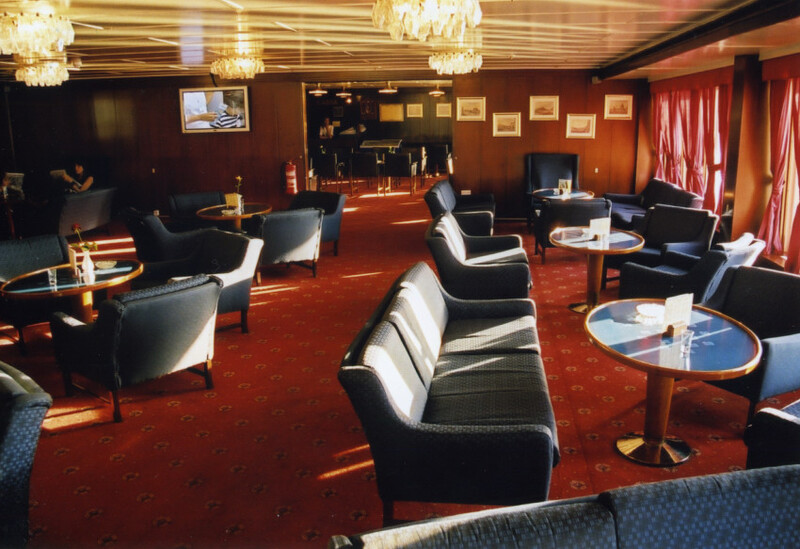 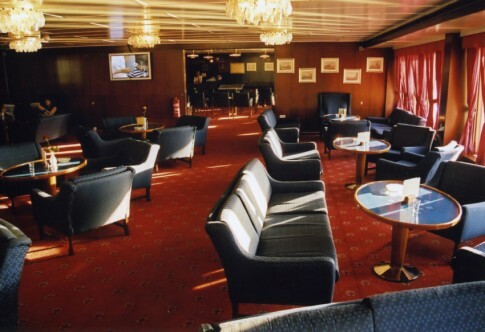 Further aft, the aftmost port-side lounge is now rather sparsely furnished, with a big screen which is used to show football matches. 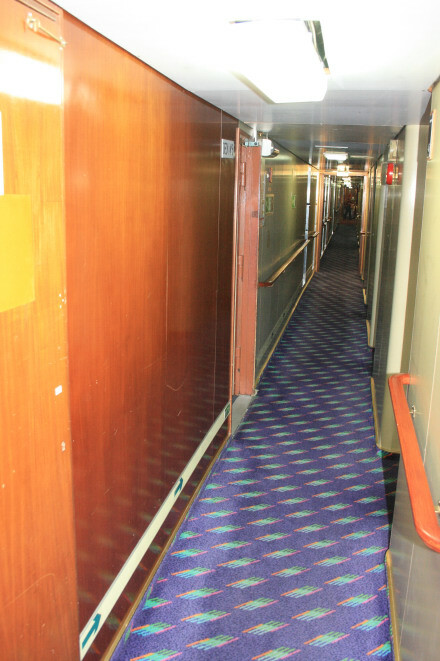 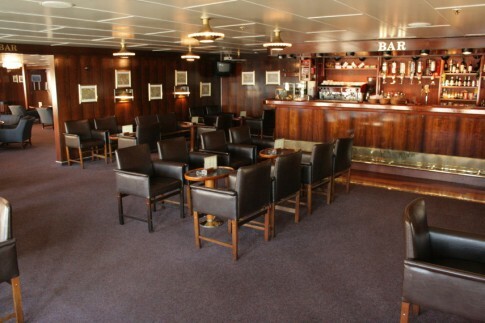 Moving over to the starboard side, here is the aft lounge. 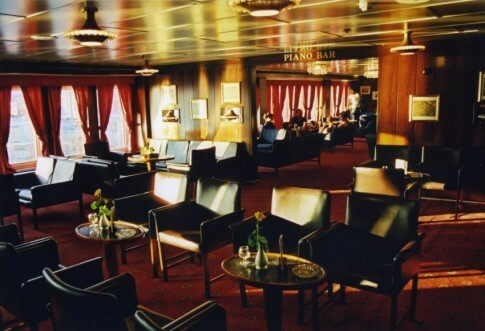 The flow of the rooms is clear in this view of the bar, just forward of the aft lounge which can be seen in the background. 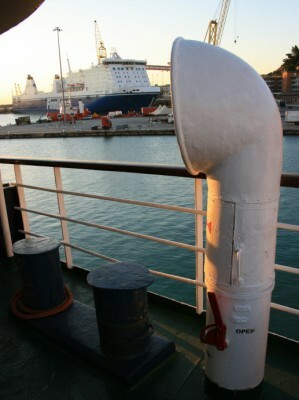 A further view, looking across to port. 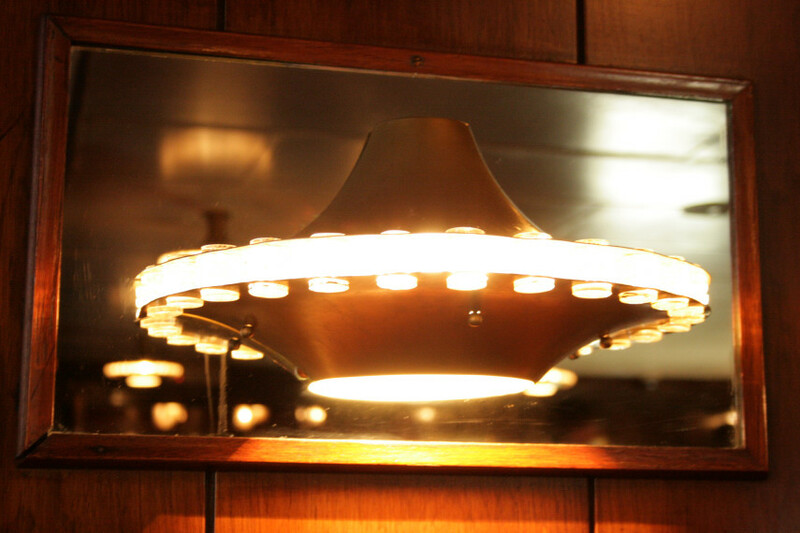 The wall-mounted light fittings in the bar give a hint of space-age excitement, albeit more Dan Dare than Apollo 11. Moving forward again, this vestibule separates the starboard gallery from the bar area. Looking forward in the starboard gallery, with the entrance to the chapel visible on the left. 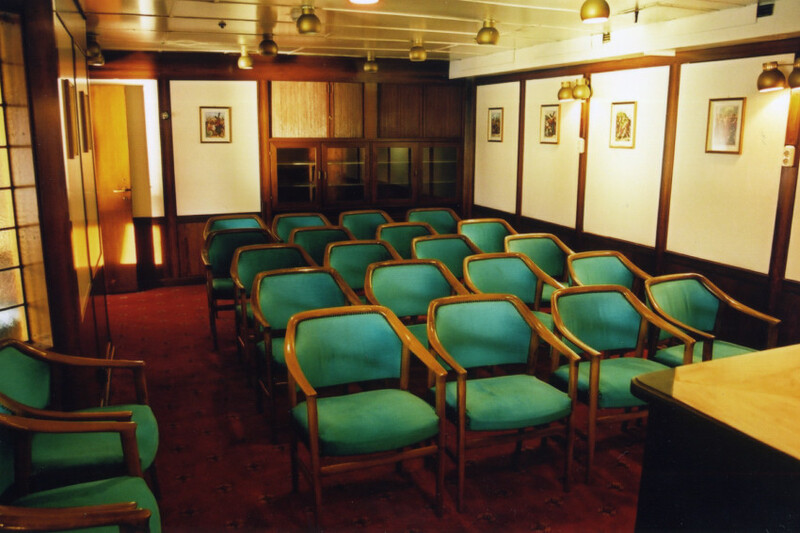 The small chapel was originally designated as a 'Club Room', and when the ship was the Hispania sailing from Southampton to Spain it became a casino. The same room with an alternative seating layout. 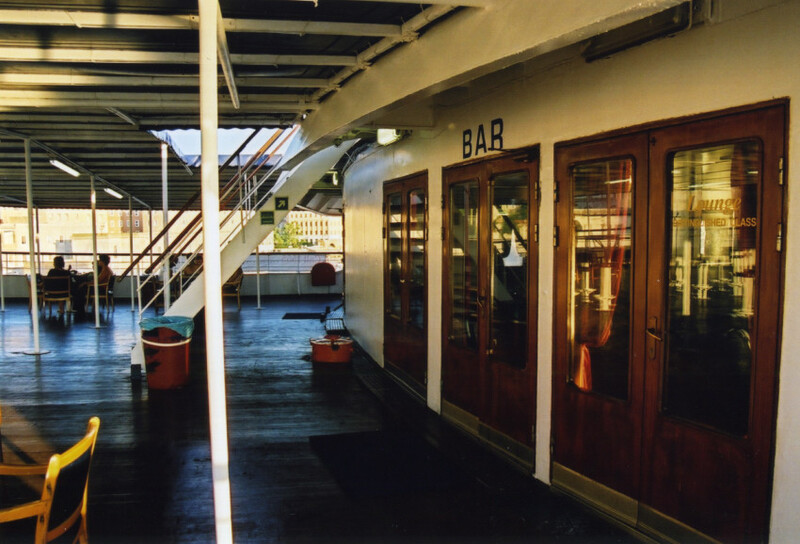 A final view of the starboard arcade, looking aft. 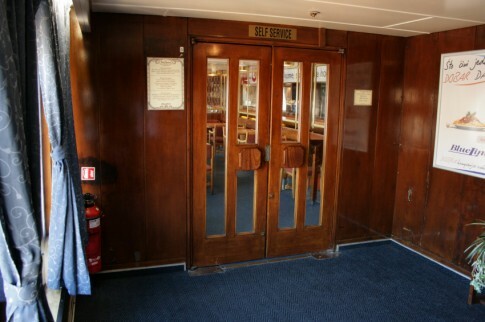 At the forward end, these rather magnificent doors lead into the restaurant area. The location of the shop originally housed a pair of private function/dining rooms and on the Hispania became the 'Alice in Wonderland Children's Restaurant'. 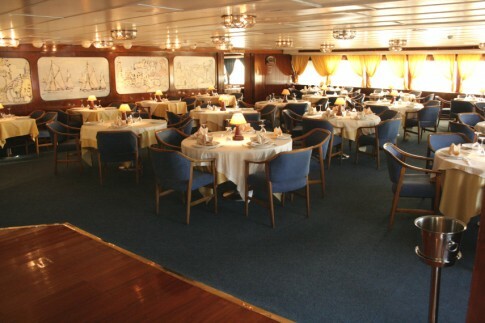 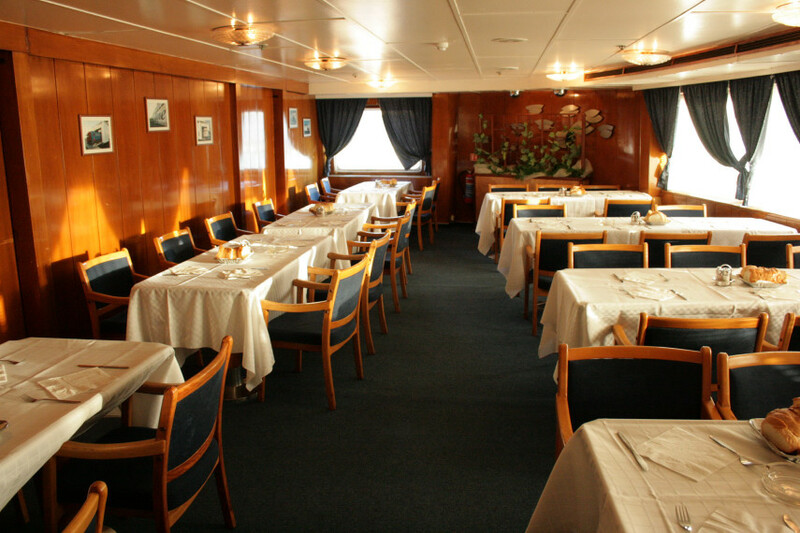 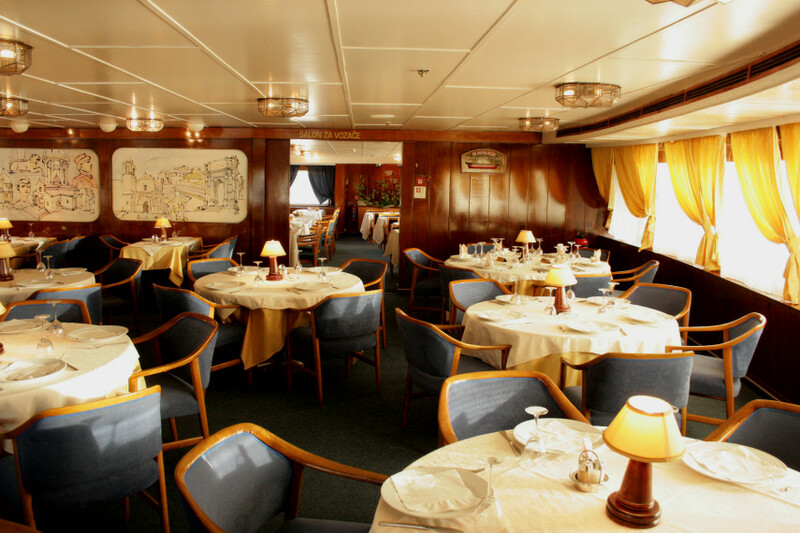 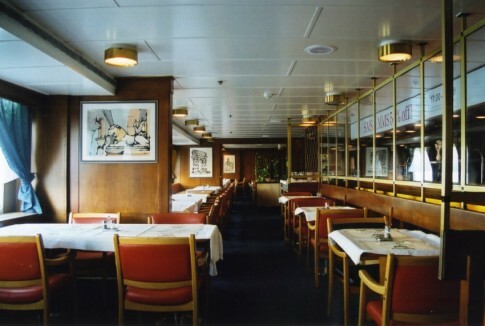 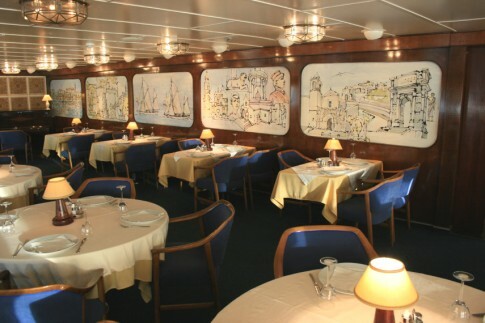 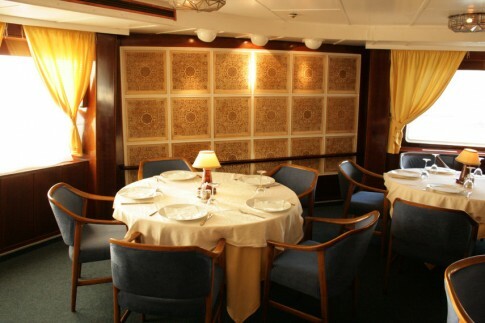 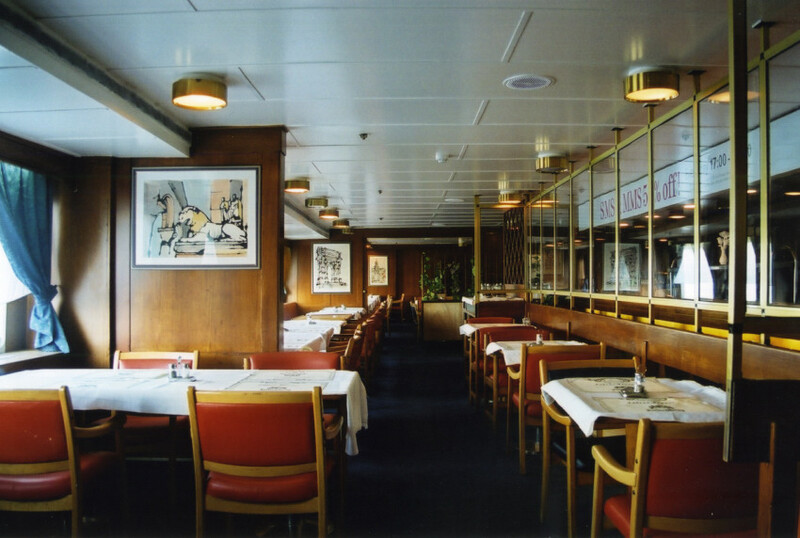 The restaurant, forward on the starboard side of the ship. 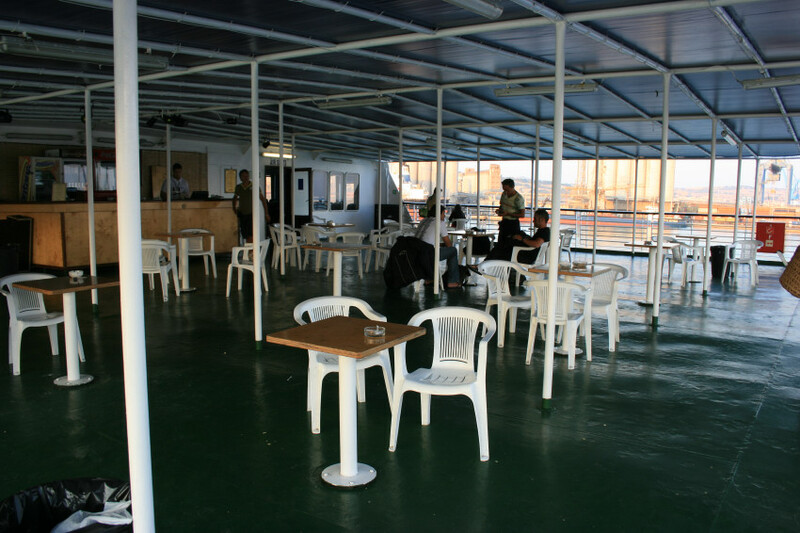 The seating area forward to port can be opened up to either the restaurant to starboard or the cafeteria, just aft, as demand dictates. 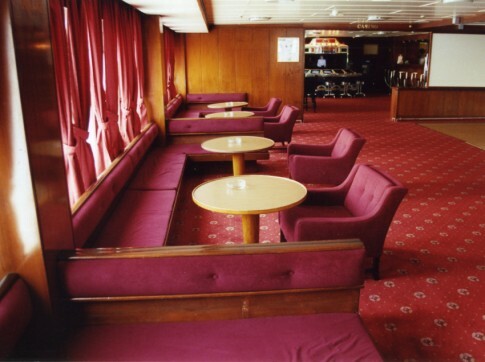 The only other interior public space of note is this unremarkable reclining seat lounge up on Boat Deck. Just forward of the reclining seats, these metal grilles in the lobby area betray the ship's two class history. 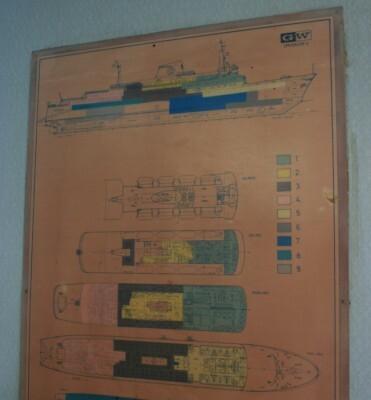 As the Ancona she is one class, and this was also the case, technically, when built. 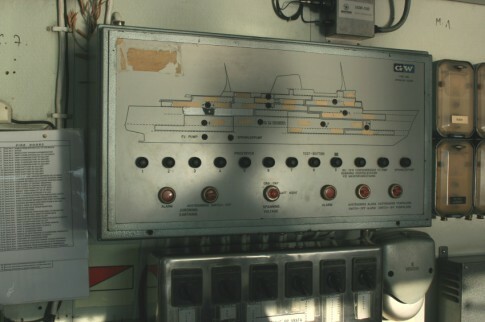 In operation for Minoan Lines however a strict division was maintained. 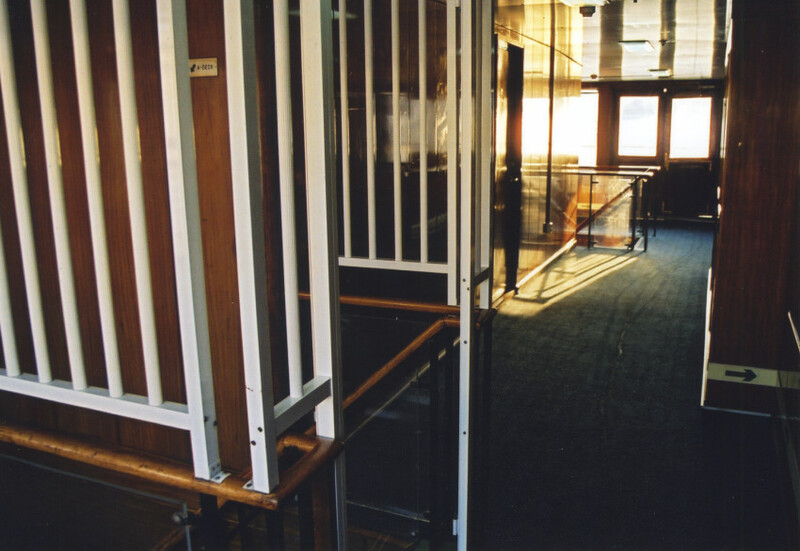 These grilles have now been removed. 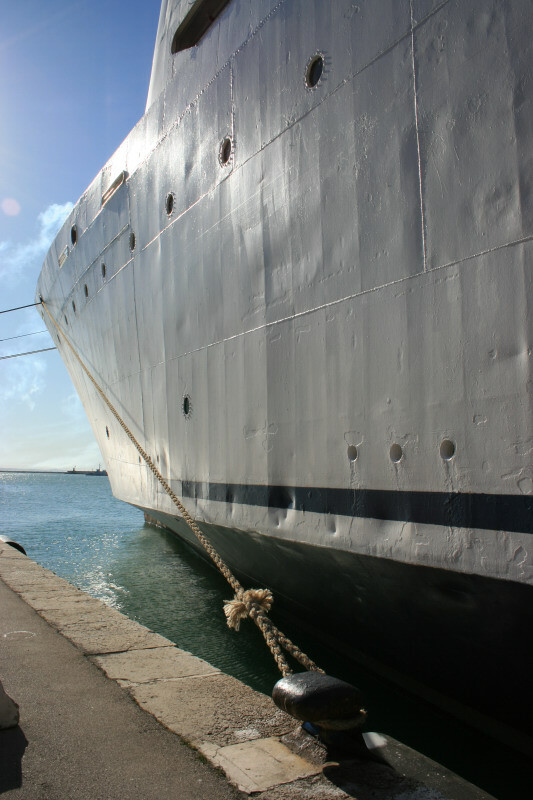 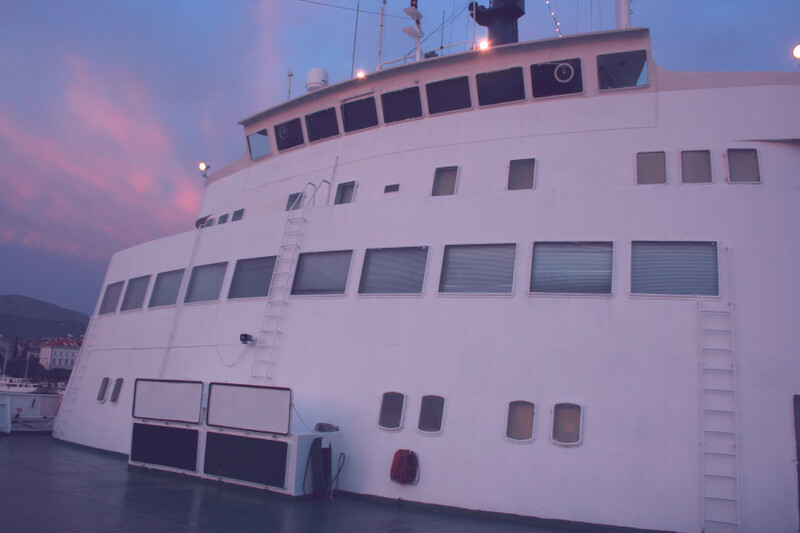 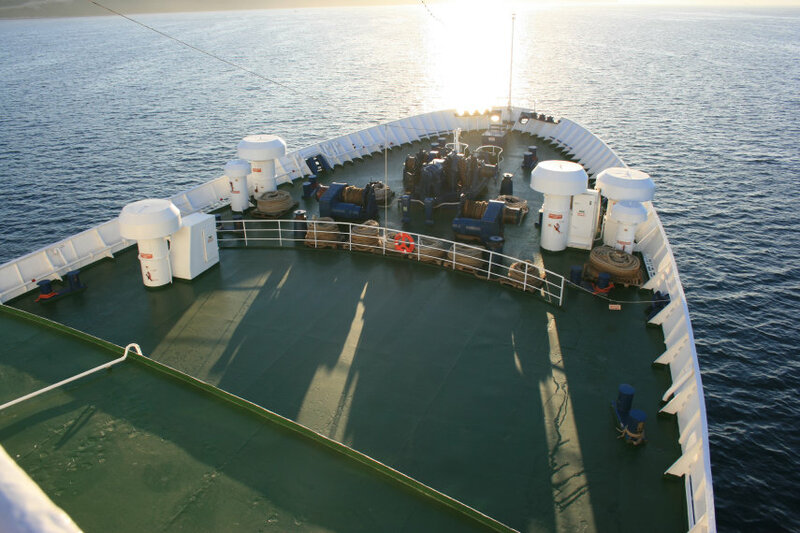 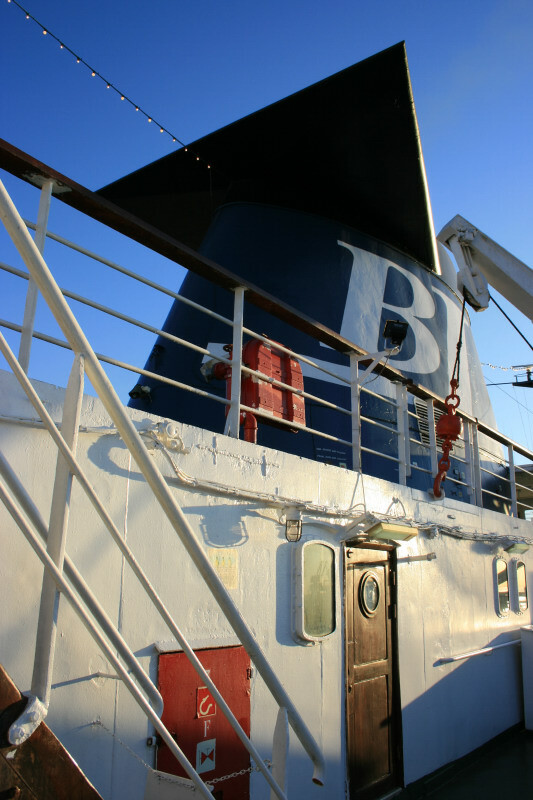 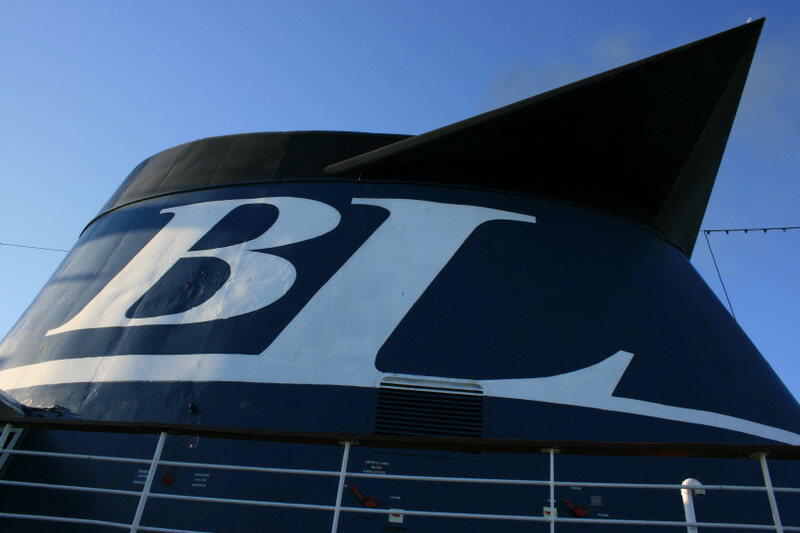 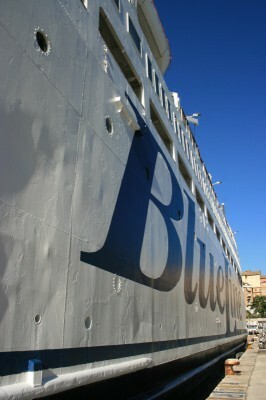 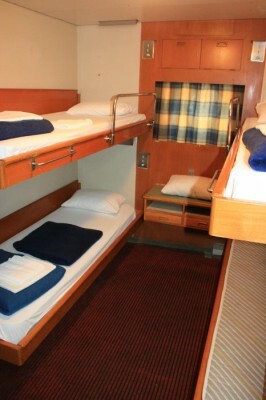 The bulk of the overnight accommodation is provided in two and four berth inside and outside cabins on Decks 5, 4 and 2. 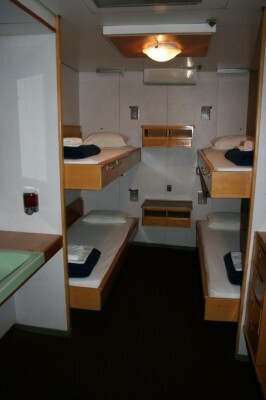 Here is a 4-berth inside on Deck 4. 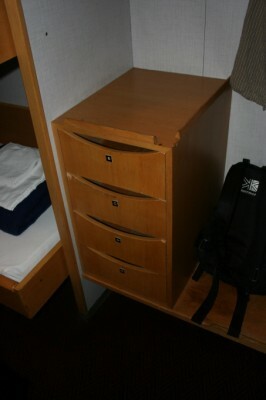 The ship was designed for relatively short crossings, but each berth was provided with one drawer in this unit and another in the fittings adjacent to the bunks. A standard 4 berth outside cabin. 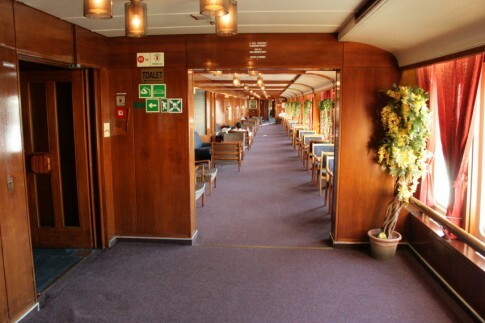 One of the main cabin corridors. 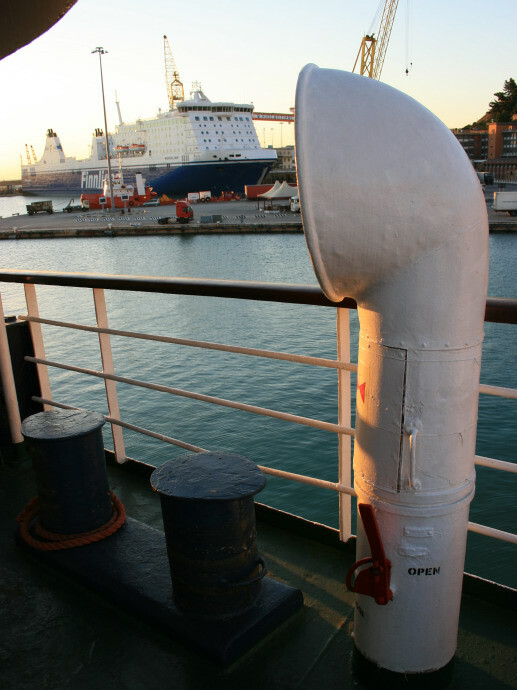 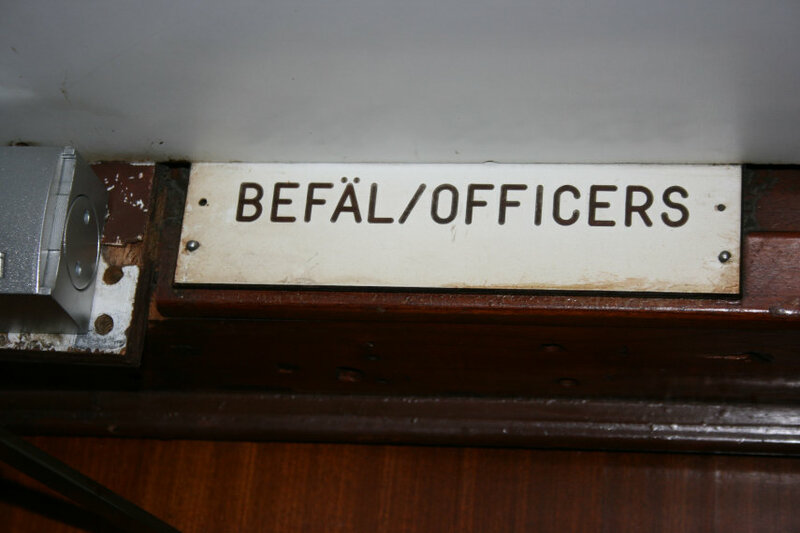 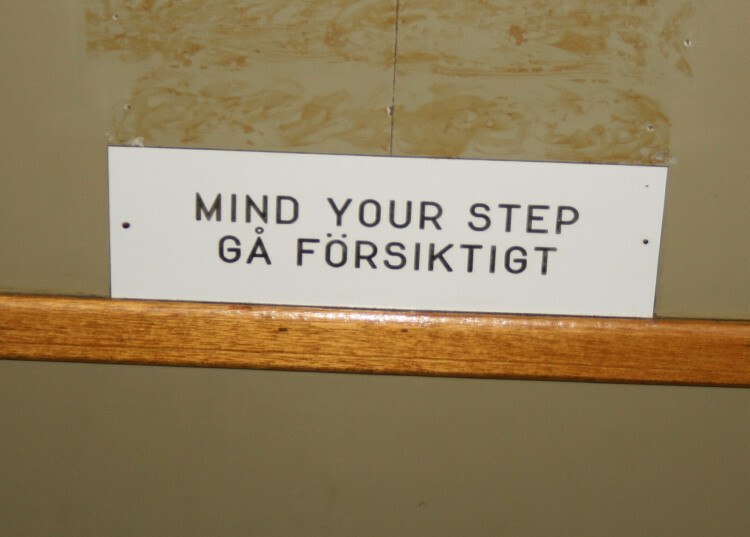 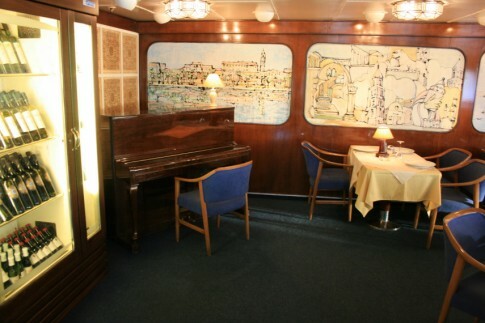 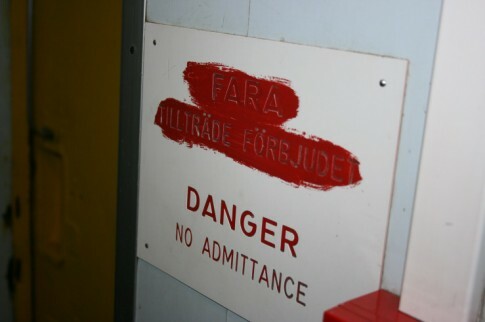 Ancona Miscellany - throughout the ship there are reminders of her Swedish origins. 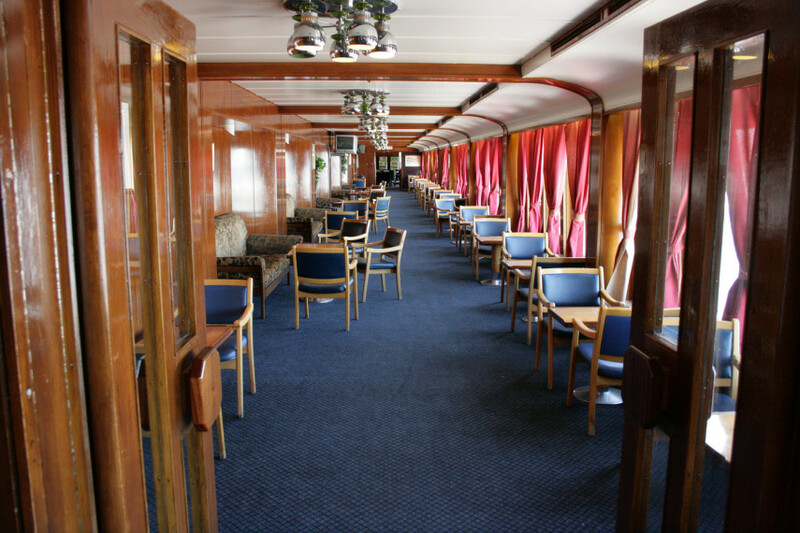 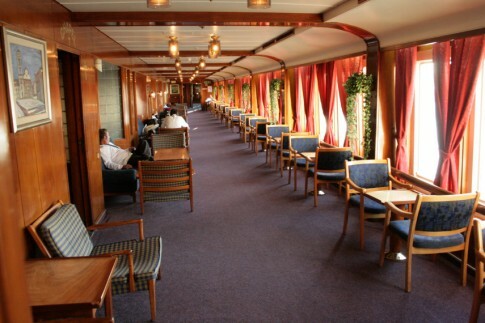 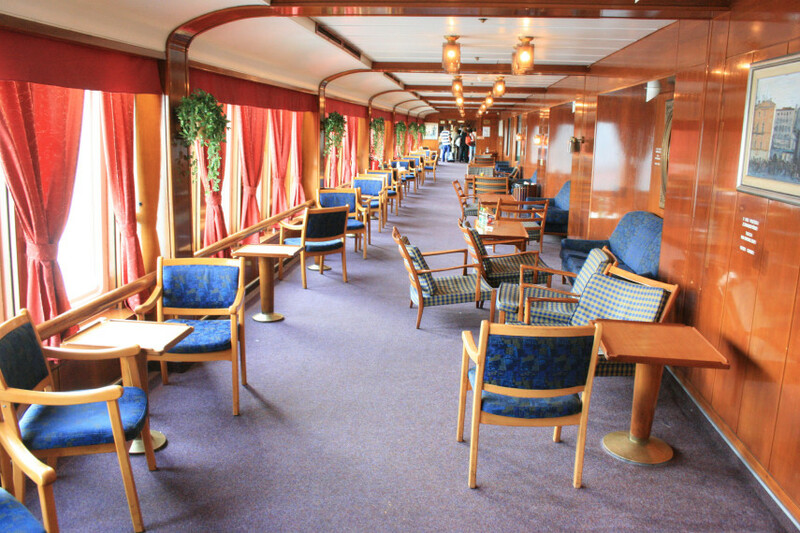 The outside deck adjacent to the aft lounges on the Saloon Deck. 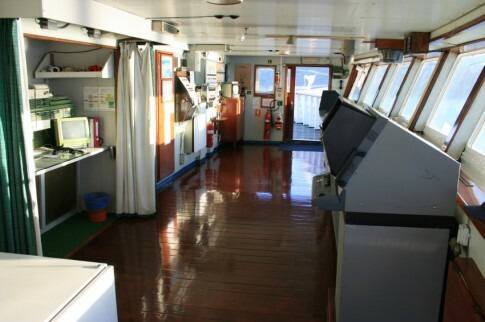 Another view of the aft deck space on the Saloon Deck. 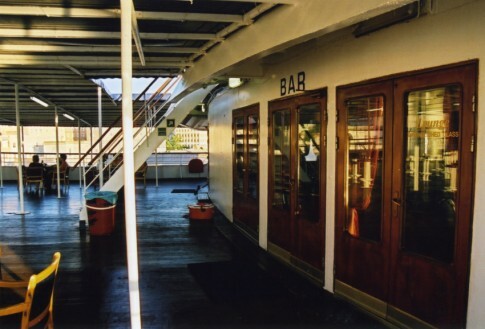 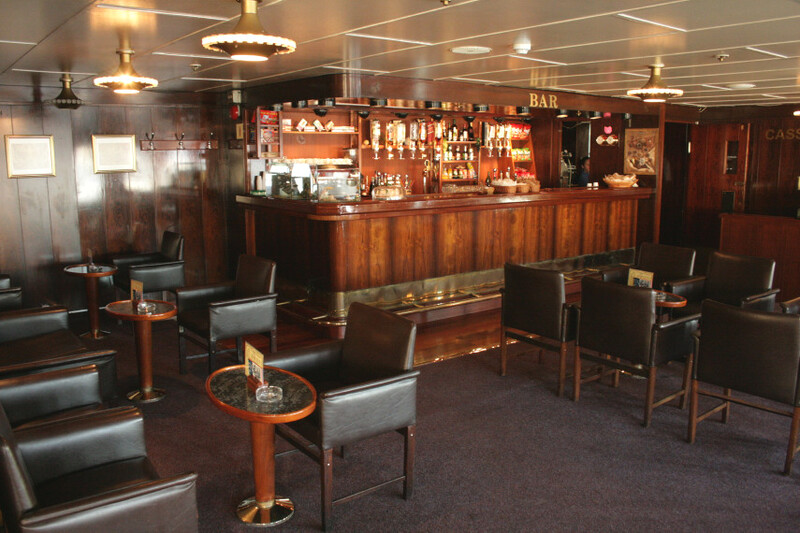 A deck bar can be found on the deck above. 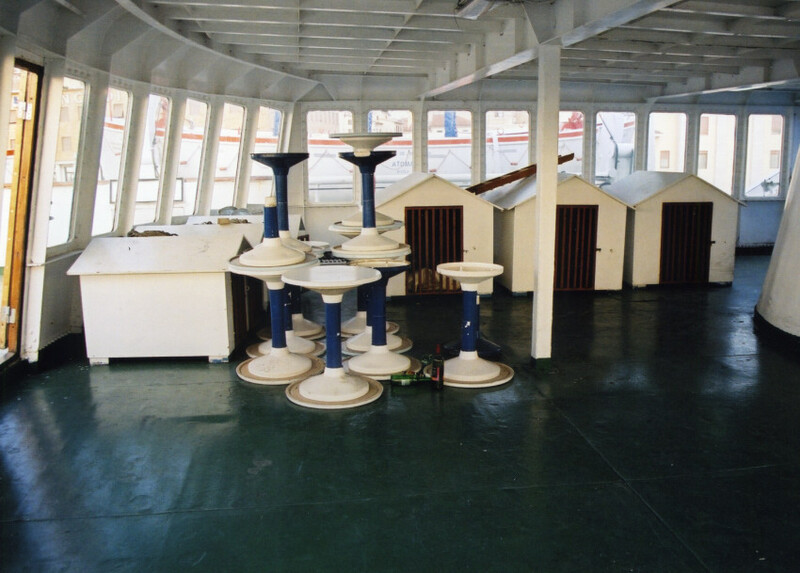 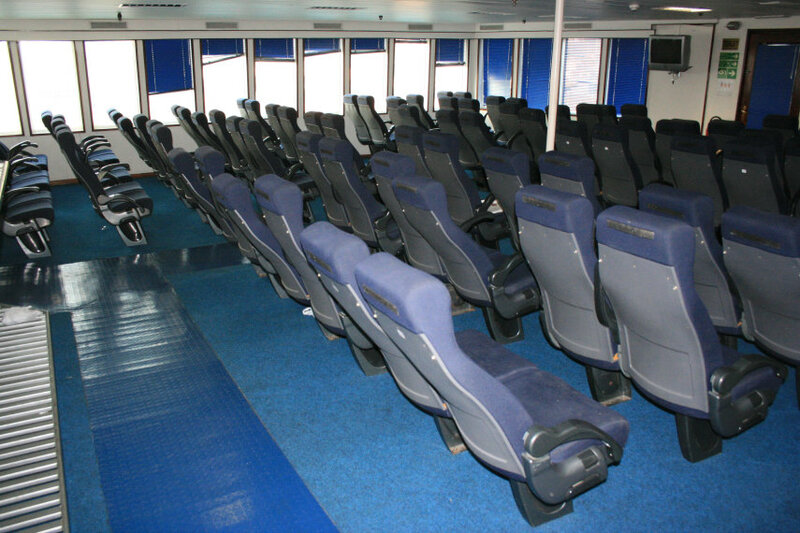 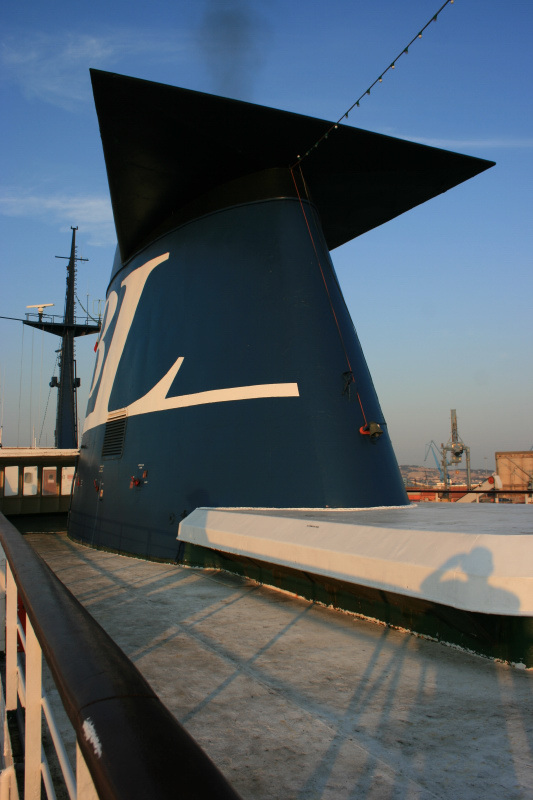 The deck space around the funnel, pictured in 2004, is now closed off to passengers. 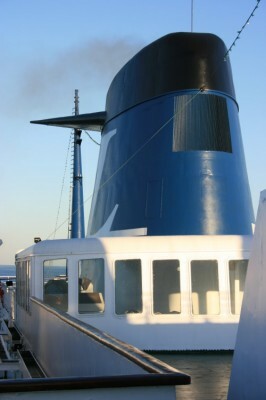 The covered area just forward of the funnel. 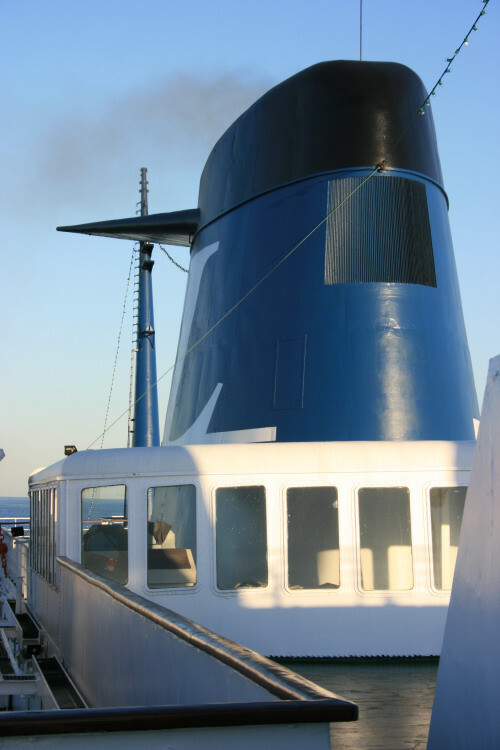 The funnel seen from the starboard Boat Deck. 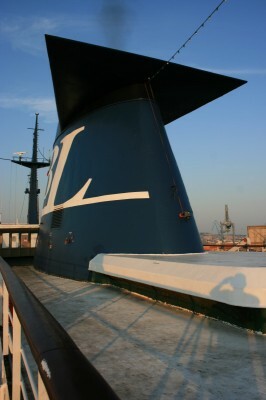 The forward superstructure, seen from the forecastle. 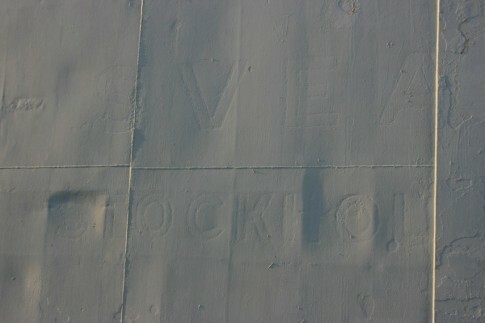 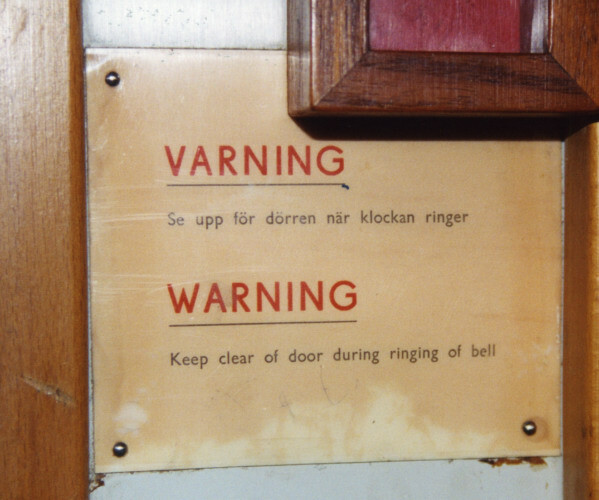 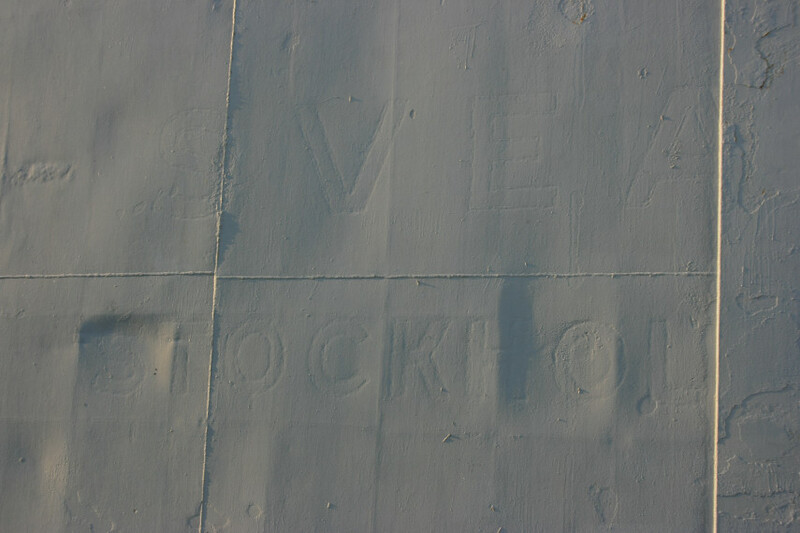 The ship's bell bears the inscription 'Saga, 1966'. 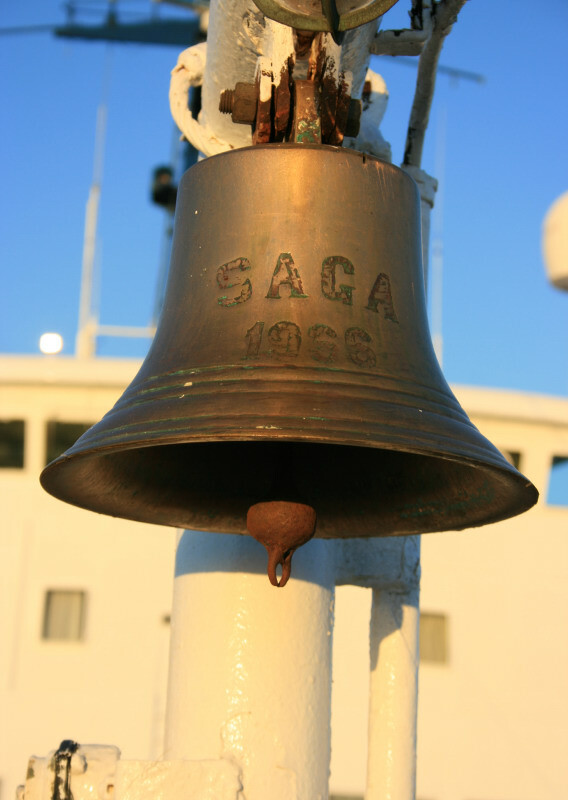 The year of build is correct, but this ship was originally the Svea - the Saga was her sister, although the Svea did later bear the name so the provenance of the bell is uncertain. 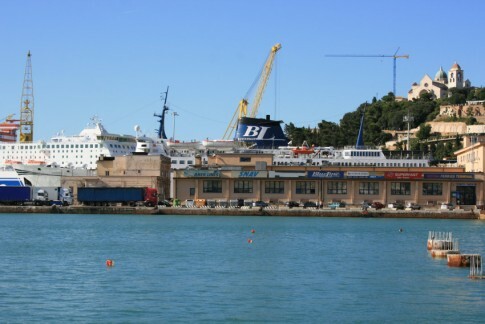 At Ancona in 2007, the Nordlink of Finnlines is seen from the Ancona in the process of being handed over to her owners by the Fincantieri shipyard. 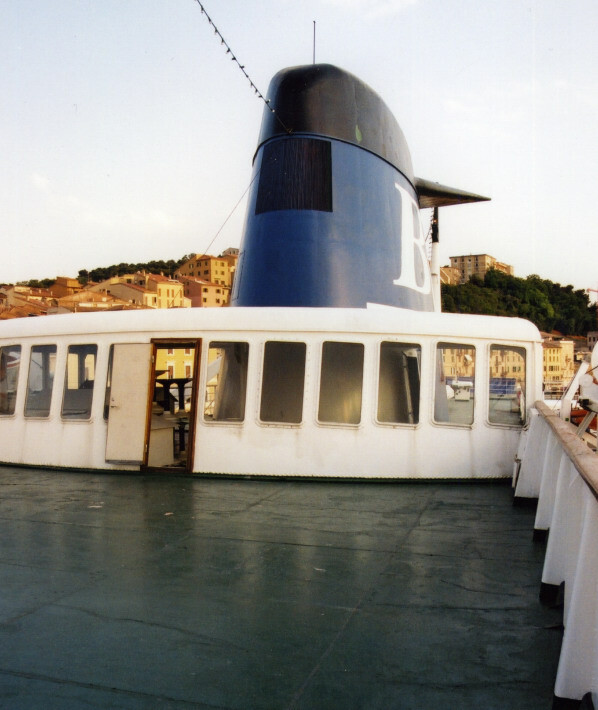 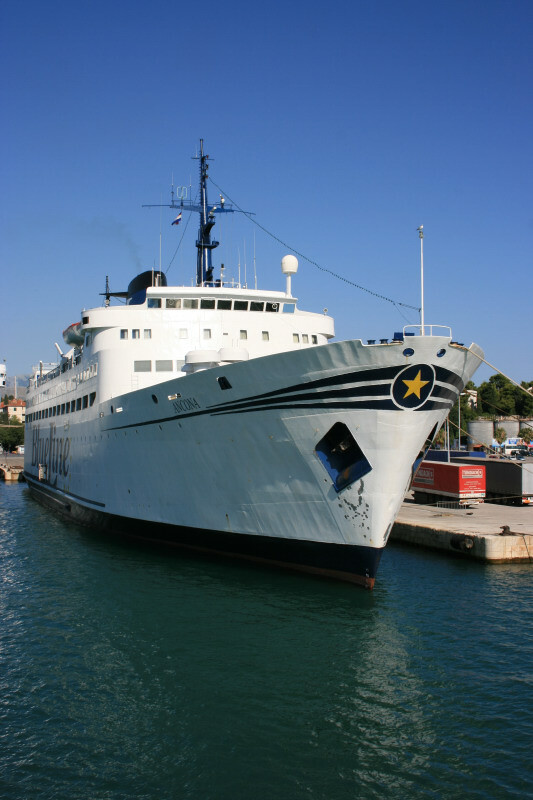 The Ancona's sister ship, the ex-Saga, wore these funnel colours during her three year stint as the Finnpartner in the mid-1970s. Another view of the port-side promenade. 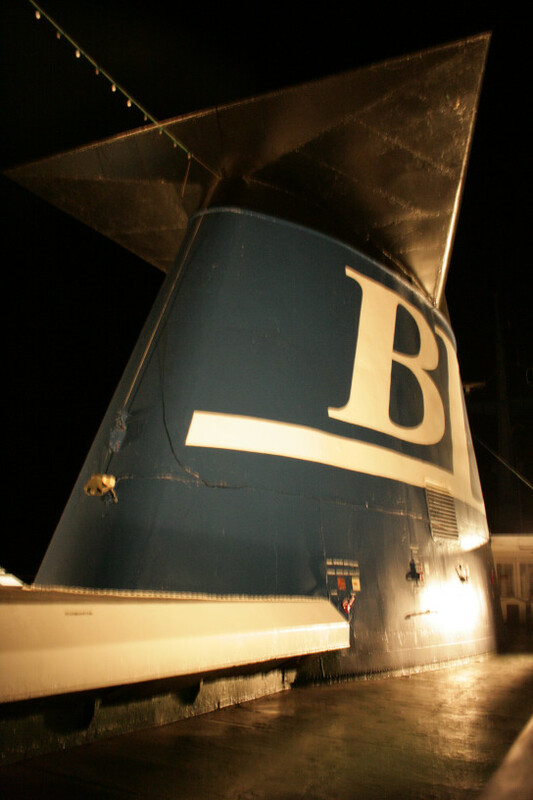 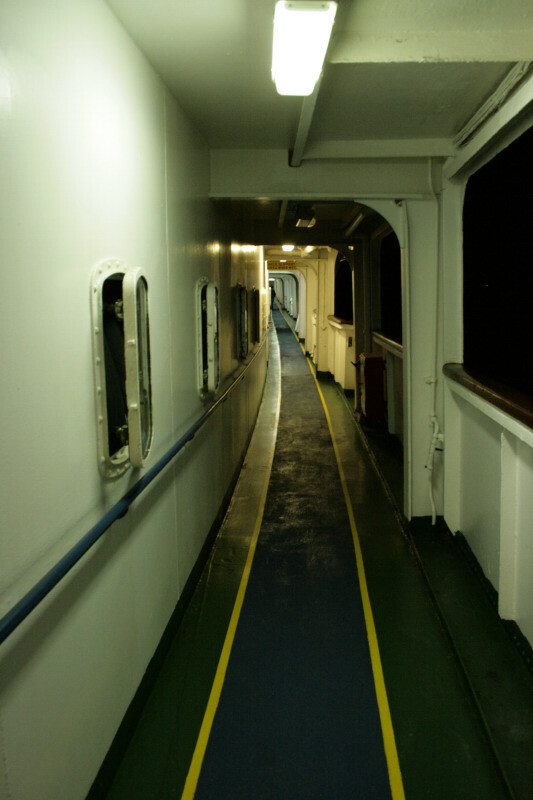 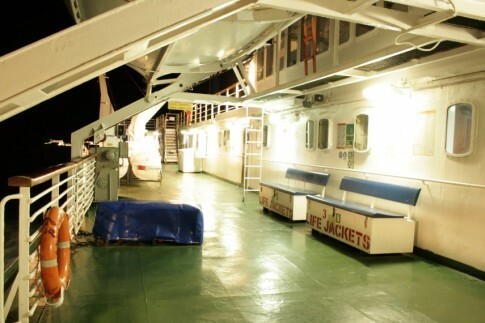 The starboard outside deck at night. 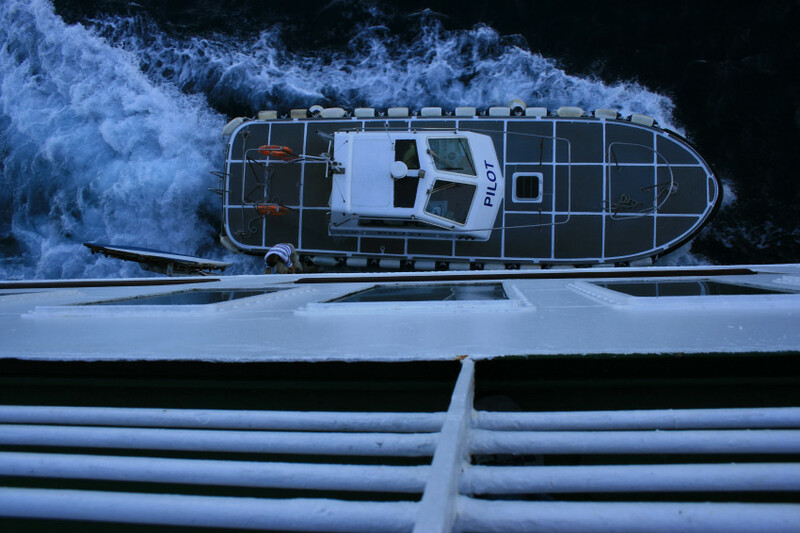 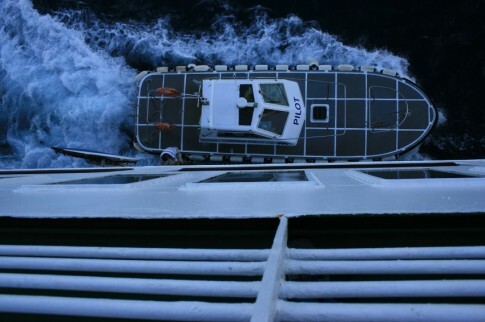 The following morning, taking on the pilot as we approach Split. Looking aft from the bridge wing.